Grass stem of Ephedraceae including Ephedra sinica Stapf. , E. equisetina Bge., E. intermedia Schrenket CA. Mey. Hebei, Shanxi and Inner Mongolia Autonomous Region of China. Slightly fragrant smell, astringent and slightly bitter taste. 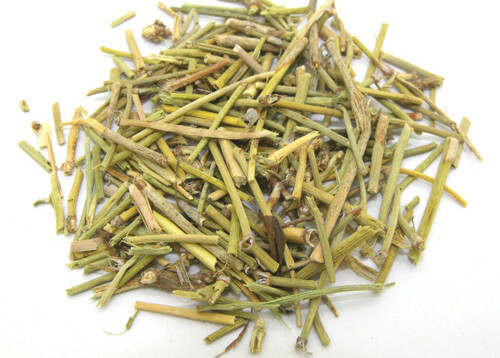 Dry with big stem, light green color, substantial core, bitter and astringent taste. Cooled and dried, cut into pieces, unprocessed, honey processed or pounded into fine floss. Pungent, slightly bitter, warm;lung and bladder meridians entered. Induce sweating and release exterior, relieve dyspnea and alleviate cough, promote urination. This herb is pungent and warm with relatively strong actions of inducing sweating and releasing exterior. It can induce sweating and disperse the exterior wind-cold pathogen which has invaded. It is suitable for wind-cold exterior stagnation in wind-cold exterior excess syndrome where the pores are closed and there is no sweating. It is usually necessary to be used with Gui Zhi in order to strengthen its ability of inducing sweating and dispelling cold. Because it also can relieve dyspnea and with the ability of treating both the root and the branch of the diseases, it is especially suitable for wind-cold exterior excess syndrome with dyspnea and coughing. It is usually combined with herbs that induce sweating, release exterior, relieve dyspnea and stop coughing. For instance, as in Ma Huang Tang from Shang Han lun. 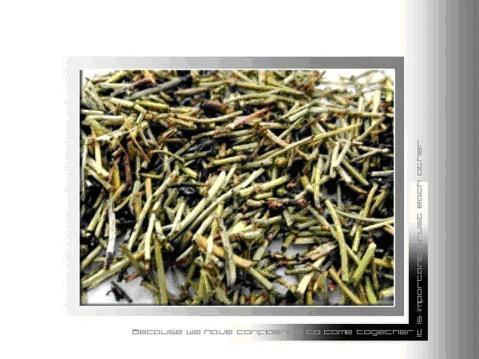 Since this herb can ventilate and descend the lung qi, it can relieve dyspnea and stop coughing. For this reason, it is the key herb for dyspnea and coughing due to blocked lung qi. Because it has the double action of dispersing wind-cold and relieving dyspnea, it is especially suitable for wind-cold fettering the exterior where there is acute dyspnea and coughing due to a loss of the lung's ability to ventilate and descend. It can treat the fundamental and incidental aspects of this kind of syndrome. For instance, it is usually combined with Xing Ren to stop cough and relieve dyspnea in San Ao Tang from Tai Ping Hui Min He Ji Ju Fang （Formularies of the Bureau of People's Welfare Pharmacy). This herb also has the action of promoting urination and reducing edema, and can be used for syndromes where there is edema and difficult urination. Because it can diffuse and descend lung qi, it can open and regulate the water pathways and transport to the bladder. It can also induce sweating and release exterior. For this reason, it is used for early stage edema with exterior syndromes. For instance, it is very effective when combined with Gan Cao in Gan Cao Ma Huang Tang Tang from Jin Kui Yao Lue (Synopsis of the Golden Chamber). If it is combined with other herbs that promote urination and reduce edema, the effect of the treatment will be even better. For instance, it is combined with Bai Zhu in Yue Bi Jia Zhu Tang from Jin Kui Yao Lue. Aside from the above, this herb can disperse wind-cold, and it is also indicated for rashes, pruritis, nasal obstruction and runny nose due to wind-cold. Because of its ability to dispel cold and release stagnation, it can be used for wind-cold arthralgia with pain and other interior cold syndromes. Decoct 3~10g. The unprocessed one has a strong action of inducing sweat and is suitable for wind-cold exterior syndrome; honey fried Ma Huang is good for relieving dyspnea, and suitable for lung heat coughing and dyspnea; Ma Huang floss is more mild and suitable for use in children, the elderly and people with weak constitutions. It is prohibited to be used for patients with deficient dyspnea without blockage of the lung qi, it should be used with caution for patients with hypertension and insomnia because ephedrine can stimulate central nerve system and raise blood pressure.